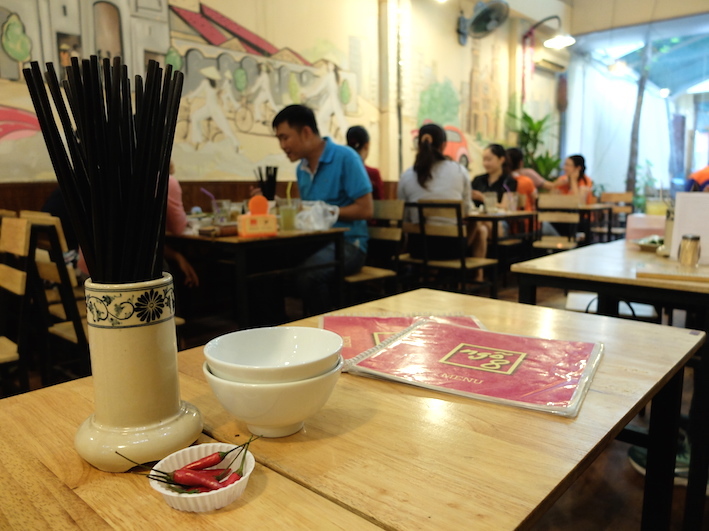 Special mention to this little well maintained restaurant that serves authentic Saigonese cuisine, not far from the War Remnants Museum in Ho Chi Minh City (Saigon) – ideal to gather strength before or recover after the visit. The Ngõ 8 Restaurant is built as a lengthy room, with in the forefront a nice little terrace that invites you to come in, followed by a simple well-lit interior. On each side of the central aisle, a succession of low tables and chairs are placed along nicely painted walls. The menu only has a few pages (compared to other very thick ones) but it proposes a selection of authentic dishes, which arouse the curiosity and defy the palate. Prices are more than attractive, as dishes cost between 10 000 and 70 000 dongs. 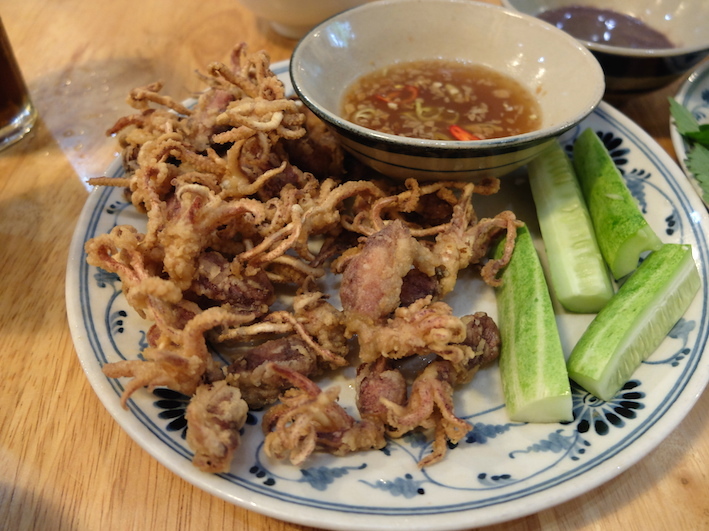 We let ourselves be tempted by a plate of fried baby squids with tamarind sauce and fried tofu and rice vermicelli with… shrimp paste (Bún đậu mắm tôm). This is a grey-purplish quite odorous sauce, not well known by Western palates but which is worth a try, to our mind. If we have to make a comparison, the smell reminds vaguely the fish sauce that we know. 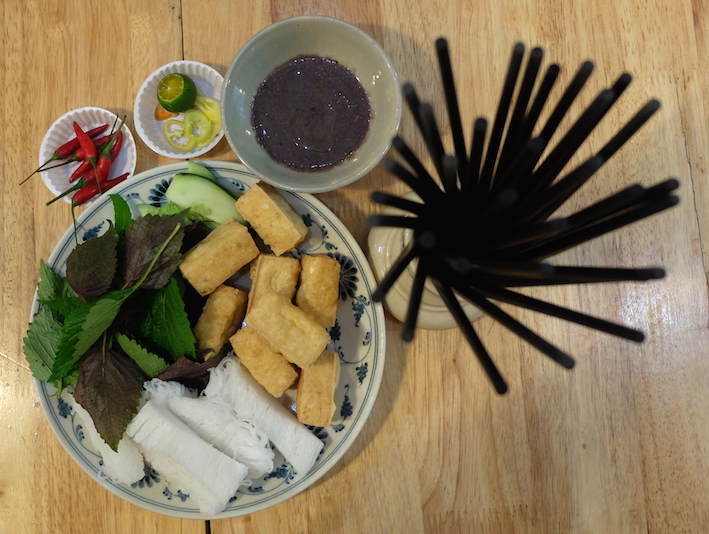 So, we have to dip the fried pieces of tofu, some herbs and rice vermicelli in, and the whole reaches a good balance in the mouth, certainly a bit special (still from a Western point of view), but very interesting. 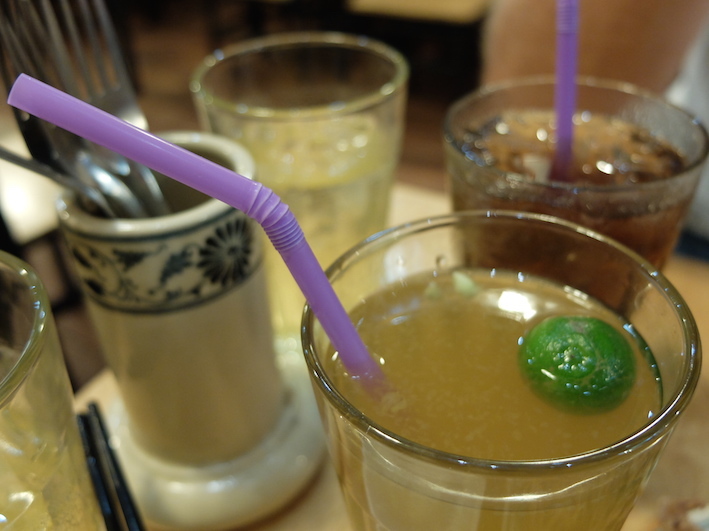 To quench our thirst, we ordered a delicious kumquat tea and a Nhân Trân, a plant-based refreshing drink. Very good. At the Ngõ 8 Restaurant, if the staff only speaks a little English, it is without doubt dedicated to customers! 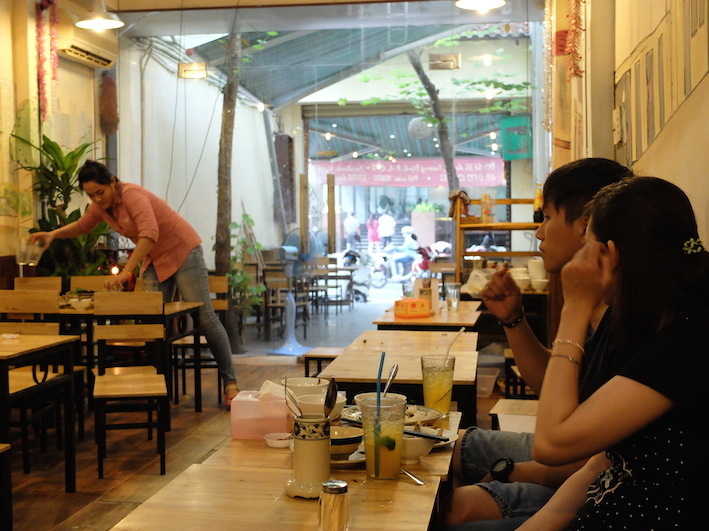 So, not so many problems to communicate and we have the assurance of sharing a bit of local life at this charming address which looks a bit like a canteen “++”, mainly frequented by Saigonese people. 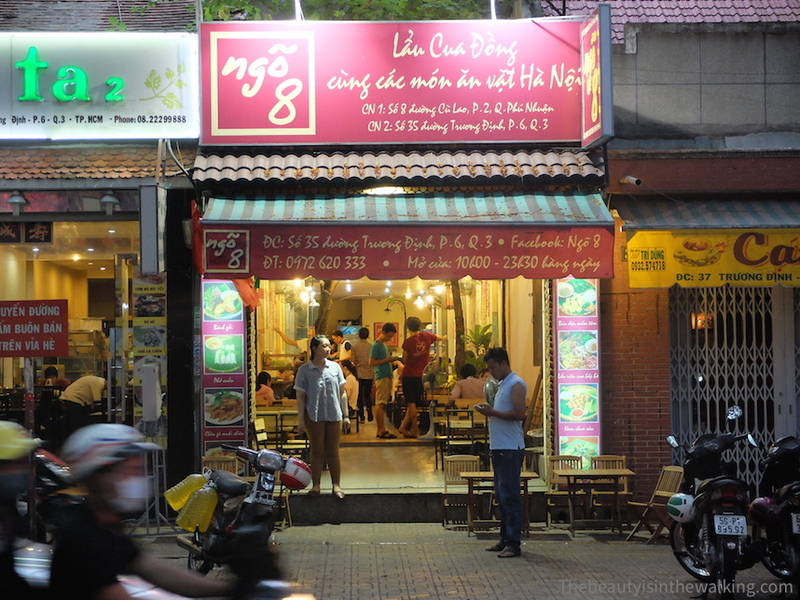 A second address is situated at số 8 đường Cù Lao, F2, Phú nhuận, Ho Chi Minh City. Oh Veron, I can almost taste it! When you come to Adelaide Aja and Tim are the Vietnamese restaurant experts but there is an excellent one in the Barossa Valley that we took your Mum to. Also we will need to go to Golden Boy in Adelaide and sample their TukTuk menu. 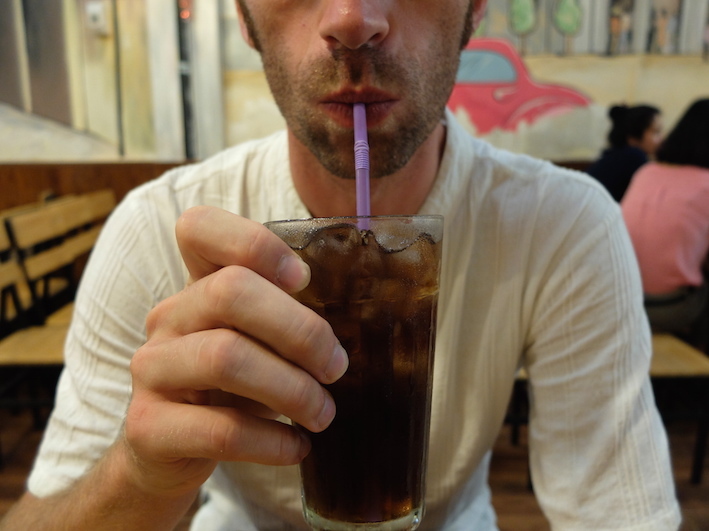 Thai food and tres magnifique! Was the sauce made from blachan? Great program in perspective, Marion! :-) I don’t know what blachan is, but I looked on the Internet and it seems to be like chili sauce, right? Actually, neither the tamarind sauce nor the shrimp sauce were spicy. 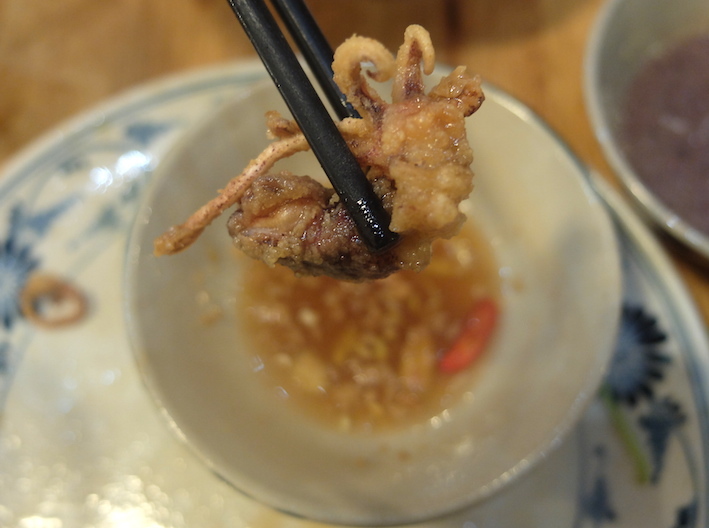 The tamarind sauce is sweet and fruity, and the other one has quite a strong taste of salty fermented shrimp.